Combination of wide open to cottonwoods. Some elevation and high pasture grass. Shoes and long pants recommended (prickly pear cactus and yuccas). 26 holes total with seasonal holes A and B. *July 14, 2014. Gates locked and fairways overgrown. I 70; exit on Ward and go north to a left (west) on 64th Ave., 3.8 miles to the DGC on the right across the street from Long Lake Regional Park next to dog park. 18125 64th Ave. It is a good course but it needs a little more work. I did like the locations of the baskets. You need a red or orange disc because it is hard to find your disc in the brush. I would still go again. A good course with a couple nice holes and some good elevation changes. Windy and dusty! I would play it again but there are other courses in the Denver area I would go to first. This is a great course that appears to be in the process of growing additional holes. The first 18 holes are well maintained, well designed, an provide a variety of challenges mixing decent length with a couple large elevation changes and a few tree-laden holes. All in all a very pleasent course with birdie potential on most holes. After hole 18 there are no concrete pads and it's a bit harder to see where to play, but it appears that there is steady work being done on these holes circa March 2010. This is my "home" course and I enjoy every round. John Bird and his team of volunteers have done a fantastic job of steadily improving the course. There are several pin placements and lots of long (and very long) holes. 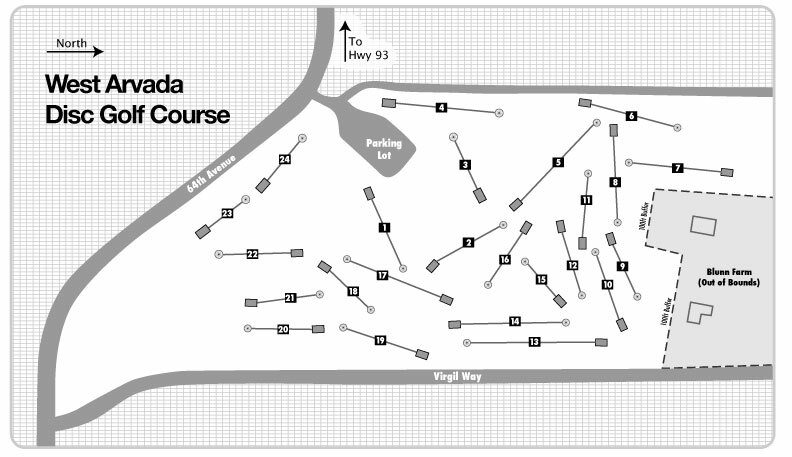 The course location can be very windy, and sometimes the biggest challenge is the wind.